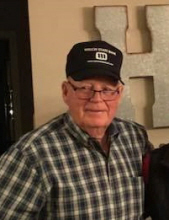 Ellis “Kay” Armstrong, 80-year-old lifetime Welch resident, passed away early Tuesday, February 19, 2019 at the Freeman West Hospital in Joplin. He was born on October 31, 1938 in Welch, to Rufus Paul “Shine” and Elizabeth Arminta (Vicory) Armstrong. Kay attended Welch Schools. He was united in marriage to Carol Sanders on December 30, 1961 at the Baptist Parsonage in Welch. He worked at the Neil Feedlot in Welch for 15 years, before going to work for Leon’s Coal Company, he later worked for several other coal copanies including, Turner Brothers Coal Company in Welch and Muskogee, Ranchers Coal and lastly for Brakefield Coal Company retiring from there in 2008. Kay was very involved in pony pulling contest all over Oklahoma and Kansas, He had been the chairman of the pony pulling at the Tulsa State Fair. He was a member of Cowboy Junction Church. Kay loved his grandchildren, quail and coyote hunting, fishing and according to his granddaughter Grace he really enjoyed taking naps. He was preceded in death by his parents, two children, Douglas and Leslie Armstrong; a brother, John J. “Jack” Armstrong and a sister, Wilma Lee “Sis” Oney. The family includes; his wife Carol of the home; a son, Mitch Armstrong and wife Patty, a daughter, Jennifer Braden and husband Todd, all of Vinita; grandchildren, Mariah, Katy Jo, Chloe, Livie and Hollister Armstrong and Grace Braden; his sisters, Verla Smith of Nowata, Dean Harden and husband Melvin of Welch, Maxine Highsmith of Welch, Vivian Helms of Welch and Dixie Heflin of Pittsburg, Kansas; his brothers, Bud Armstrong of Commerce and Joe Armstrong and wife Cindy of Vinita; numerous, nieces, nephew and other relatives. The family will receive friends from 6 to 8 PM on Friday, February 22, 2018 at the Burckhalter-Highsmith Funeral Home Chapel. The celebration of life service will be held on Saturday, February 23, 2019 at 11:00 AM at Cowboy Junction, Greg Highsmith will officiate. Interment will follow at the Rogers Cemetery northwest of Welch. Online condolences may be made at www.highsmithfh.com or on the funeral home Facebook page. Arrangements are under the direction of the Burckhalter-Highsmith Funeral and Cremation Services, 201 N Wison, Vinita, OK 74301. Phone 918-256-6444. To send flowers or a remembrance gift to the family of Ellis Kay Armstrong, please visit our Tribute Store. "Email Address" would like to share the life celebration of Ellis Kay Armstrong. Click on the "link" to go to share a favorite memory or leave a condolence message for the family.